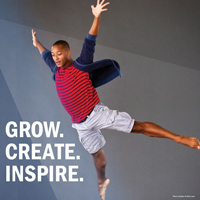 Registration is now open for Webster University's annual Department of Dance Summer Dance Intensive July 25-29, and its second annual Junior Summer Dance Intensive July 20-22. The summer intensives will be held in the Jean and Wells Hobler Center for Dance. High school students and middle school students are invited to participate in classes taught by Webster’s Department of Dance faculty. Daily discussions will explore topics important to aspiring dancers such as nutrition, injury prevention and treatment, and the life of a professional dancer. Both summer intensives will include daily classes in ballet and modern dance. Participants will also have the opportunity to be exposed to various dance styles such as jazz, tap, aerial, improvisation and hip-hop. Webster Dance faculty and professionals working with dance companies in the St. Louis area will teach these classes. Click here to review tuition and registration deadlines. For more information on the summer intensives or Webster Dance, call 314-246-7747, email dance@webster.edu or visit the Department of Dance website.